Root canal treatments, sometimes referred to as root fillings, are usually performed when a tooth has a particularly large cavity that has reached the depths of the nerve chamber. You might also need a root canal treatment if a tooth breaks, exposing the nerve, as when this level of damage occurs the nerve can become infected and die – this then needs to be removed so the space can be filled. 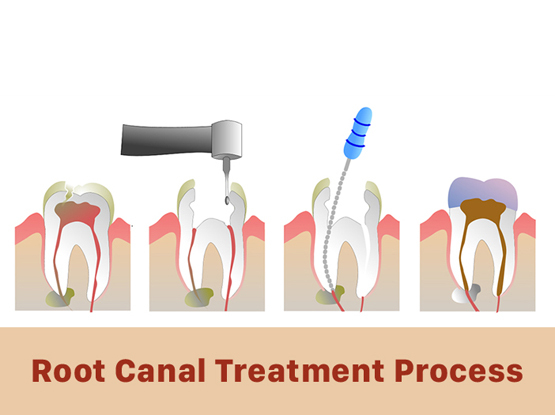 A root canal treatment is usually completed in several separate stages. On your first appointment, your dentist will drill into the tooth and removed the infected pulp (nerve tissue) from the tooth. The canals are then located with files, cleaned out and shaped for the next stage. Your dentist will often place a temporary filling to protect the tooth until the next stage can be completed. The second and final stage to a Root Canal Filling is where your dentist fills the prepared canals with a special wax material. Our aim at this appointment is to fill the tooth right to the end of the root where the infection used to be. This seals the now bacteria free canals and then either an amalgam, resin or crown restoration is placed over the top to protect the tooth. What Will My Tooth Look Like After Root Canal? The aim of RCT is simply to ensure we save the tooth from extraction. In order to restore aesthetics and function we usually recommend crowning the tooth as after having the nerve removed teeth often darken in appearance and may become brittle. There are many different crowns you can choose to have and your dentist will guide you in making an informed decision about which one to have.